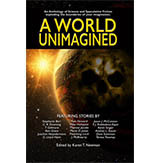 This story is #17/20 in Left Hand Publishing's anthology, A World Unimagined. Something about the aliens who've landed on the insignificant planet, Deloqk sounds too good to be true to Captain Gnarnell. She sets out to uncover what she's sure is subterfuge. If so, do the aliens prevail? Or do the Deloqkites rise to the occasion? What happens to Gnarnell, her troops, and her planet will keep you speculating and turning pages until the end. At just over 10,000 words, "What Goes Around..." is a quick, compelling read. This story is #8/24 in Left Hand Publishing's anthology, Mindscapes Unimagined. While you read about scientist working on a experiment to “improve” the properties of water, you’ll explore the ins-and-outs of research and the pitfalls that accompany that life. Be prepared to be both surprised and frightened by ending of this story. You may never request a glass of water in a restaurant again. Aaron Fremont, Henry Langdon's best friend, relates a series of (mis)adventures by the best friends in this series of 9 short stories. Filled with humor, each story connects with the reader in a unique way as what always begins as innocent fun usually ends up as a story that will bring a smile to your face and joy to your heart. If you're between the ages of 10-years and 110-years, this is a book for you!